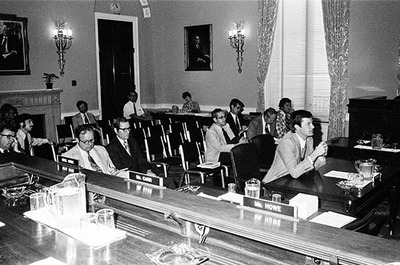 Representative Max Baucus speaking at an unidentified hearing. For additional information about the collections held by the Archives and Special Collections at the University of Montana--Missoula, or to suggest a keyword or share what you know about this item, e-mail library.archives@umontana.edu. Please include the Photo Number in your note to us.